Keep your foodstuff hygienically and in a safe manner in our exclusive collection of Aluminium canister with perfectly fitting lid. 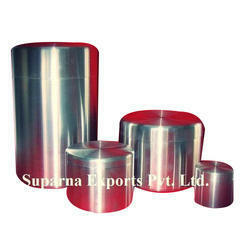 We are providing a wide gamut of Aluminum Dabba. aluminium daba size ranging from 10" to 32"
We offer a fascinating range of aluminium canisters that are available in various sizes to suit the requirements of the clients. The product is also provided in various capacities such as 250 ml, 500 ml, 730 ml, 1000 ml and 3000 ml respectively. Our range of canister can be used to keep spices, candles and vitamins. It is also used to store tea and can be also utilized for cosmetic packaging. These are Aluminium Canisters with matching Aluminium lids. These canisters can be used to pack powders, tablets like Nutritional products, Spices, Tea, Electronic Components etc. We offer a range of durable and multipurpose easy open end Aluminum Tin Jar, which are used in Cosmetics and other industries. Available in round, rectangular form, ready to use components. These products are highly demanded amongst the clients for its availability in various sizes. - Used to store spices. - These products also available in diffrent sizes like 25*28, 29*31 inch. 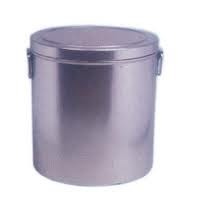 Manufactured using high grade CRCA, these Aluminium Canister or Aluminum Kitchen Pot that we manufacture are ideal for packing liquid such as chemicals, resins and pesticides etc. These drums are available with one & two openings and we provide different types of coating inside these drums.